Atwater Village residents, business owners, city agencies and volunteers came together on this past Saturday, October 1, to make our village sparkle and shine. 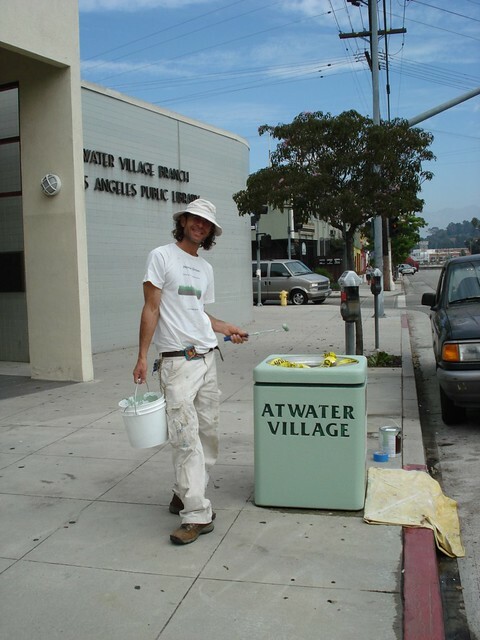 Friends of Atwater Village (FAV) would like to express our heartfelt thanks to everyone who helped make our community cleaner and greener. As part of a team effort the Atwater Village Chamber of Commerce and FAV was awarded a $2,500 “Clean and Connected Communities” grant for our “Make ‘em Sparkle Make ‘em Shine” beautification project. This joint project focused on sprucing up the commercial corridors of Glendale Blvd and Fletcher Dr. “Make ‘em Sparkle Make ‘em Shine” entailed steam cleaning, repairing and painting of the historic tile trash receptacles; as well as repainting and replanting the plant containers all along Glendale Blvd. Fletcher Dr will soon get its graffiti abatement murals cleaned and touched up – including a fresh application of anti-graffiti coating. And the river rock parkway at the corner of Larga Ave and Fletcher Dr also got weeded and cleaned. Besides these projects many volunteers helped to remove weeds from around tree wells, curbs and gutters, picked up trash, swept the streets through out the neighborhood and some of the businesses had their sidewalks steam cleaned. In addition, the Atwater Village Neighborhood Council (AVNC) was also awarded a separate grant and has already started working on improving and beautifying the landscaping of the median down Glendale Blvd. The AVNC has started their planting of drought tolerant plants on the Glendale Blvd median between Glenfeliz Blvd and Larga Ave. It does take a village to keep our village beautiful. Again, thanks to everyone who worked so hard to make Atwater Village sparkle and shine.